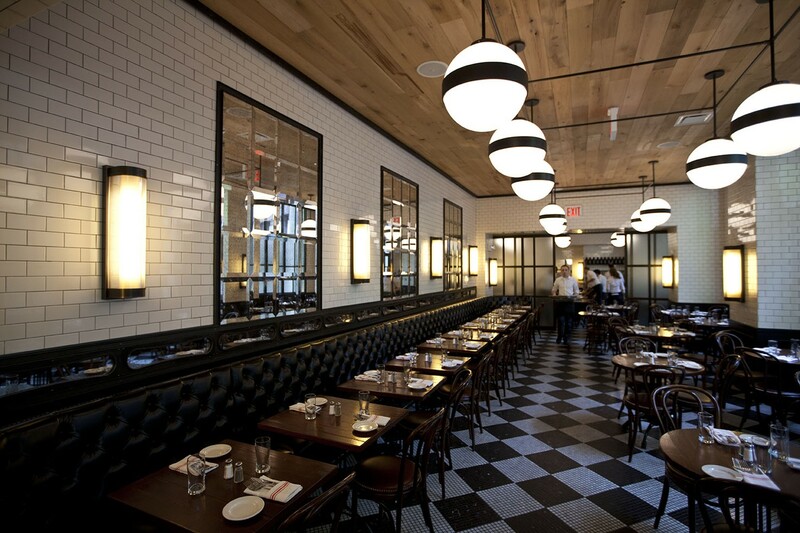 That's right, another Infatuation review for yet another location of The Smith. Why? Because we support their expansion plan of opening in areas that are in dire straights when it comes to good, casual restaurants. The Smith is one of the best of these good, casual, quickly multiplying restaurants, serving up all purpose food in an enjoyable environment day in and day out. This review is for the Lincoln Center location, which has proved to be an absolute savior. There is f*cking nothing in that area when it comes to restaurants, unless you're ballin' on that big corporate card budget and Bar Boulud all the time - which you're not. And if you've got business in the area, work in the Time Warner Center, or live in the 60's, the options were slim until The Smith arrived. They open at 7:30am daily, which is very important for weekday breakfast meetings, and close at Midnight, which might as well be 4AM in this part of town. They also have free wifi and some of the cleanest, most private restaurant toilets you'll find in NYC, which is important intel to keep in the knowledge bank. Someday you'll thank us for that intel. It may not be today, it may not be next month, but someday. You're welcome. The Smith's large menu has something for everyone, with all the diner and brasserie classics accounted for. They've got solid egg dishes, an awesome burger, an excellent steak salad, ricotta gnocchi that you'll come back for, mac 'n cheese...you get the idea here. We professed our love for the original East Village location back in the early days of Infatuation, and we still harbor those same strong feelings. As far we're concerned, there can never be too many The Smith's in this world. There are all kinds of egg dishes on the breakfast and brunch menus. None of them are going to knock your socks off, but they'll all do more than get the job done. We go with the hearty Ranchero Scramble a lot - it's a beast, what with the salsa, beans, cheddar and avocado, and tortillas. The Classic Benedict is a go-to as well. If you find yourself trying to decide between the pancakes, waffles, and french toast, let us help you make that decision - get the french toast. It's amazing. Beers and oysters are never a bad snack. The Smith Lincoln Center has a big raw bar, with at least four different kinds of oysters daily, plus lobster, clams, shrimp. Dive in. Always on our table. You can't go to The Smith and not get one of these things. Salty goodness with a side of spicy honey mustard. The Smith makes a mean calamari. They claim it's "Brooklyn style," which we assume means it thinks it is the most important calamari in the world. If you are going to The Smith, you are ordering the gnocchi. It’s that simple. This dish is a staple, and it's amazing. Get it as an appetizer to split, because it's heavy and you don't need to eat the whole thing yourself. A non-nonsense, big, beefy burger that you can customize as you wish. We always leave happy when we go this route. Also, don't sleep no the onion rings. We take our salad seriously here at The Infatuation, and this is our favorite steak salad in NYC. It's an entree-sized bowl of greens with tons of skirt steak, pickled onions (always a win), tomatoes, and a thick balsamic dressing. So good. Korean food purists will laugh at this, but we've always been impressed with The Smith's attempt at bibimbap. Is it authentic? Nope. But this bowl of rice, shiitake, spinach, pickled carrot, edamame, bean sprouts, and sunny up egg tastes pretty damn good. There's a different special ever night. Our favorites: Sunday night Spaghetti And Meatballs and Tuesday night Short Ribs. If you live in the 'hood, these are things you need to know about. If ice cream sandwiches are a special, you better be ordering one. The cakes are crowd pleasures too. Don't be shy.